Patients with MIH affected teeth suffer from dentine sensitivity once often report exacerbated sensitivity to a variety of normally innocuous thermal, mechanical and osmo-chemical stimuli (Jalevik & Klingberg, 2002) due to the presence of porous enamel and sometimes, the exposed dentine. Based on the immunocytochemical findings in hypomineralised permanent first molars, changes in pulpal innervation, vascularity, and immune cell accumulation were indicative of an inflammatory response. (Rodd et al.,2007a) Besides, the morphological aspects of MIH may favor ingress of bacterial contaminants (Fagrell et al., 2008), thereby resulting in chronic inflammation of the pulp (Rodd et al., 2007b) Following tissue inflammation, a variety of morphological and cytochemical neuronal changes may occur including neuronal branching and altered expression of neuropeptides and ion channels (Rodd et al., 2007b, Rodd & Boissonade, 2002) that seems to be related with an overexpressed dental sensitive. 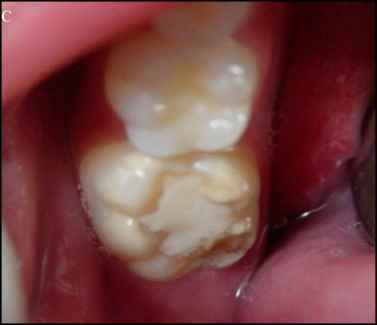 Dental pain and the severity of hypomineralisation or enamel loss in molar-incisor hypomineralisation are major determinants for the choice of treatment. (William et al., 2006a) The most conservative interventional treatment consists of bonding a tooth colored material to the tooth to protect it from further wear or sensitivity although the nature of the enamel prevents formation of an acceptable bond. (William et al., 2006b) Less conservative treatment options, but frequently necessary include use of stainless steel crowns, permanent cast crowns or extraction of affected teeth in association with the orthodontic appliance or teeth replacement with a bridge or implant.